First the big news: I ran 20 miles and felt great the whole time! This has never happened in a marathon training long run or marathon before so it feels like a huge accomplishment. 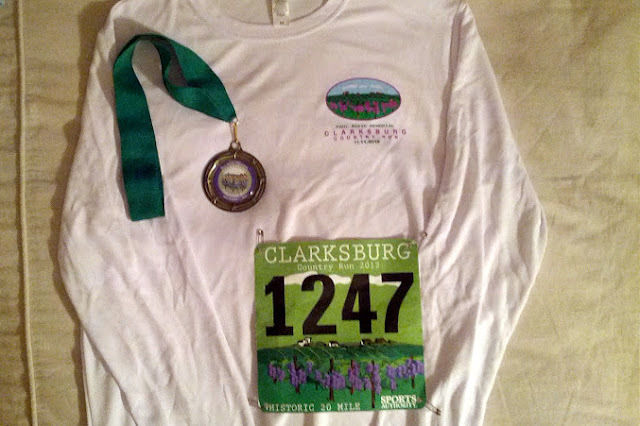 I signed up for the Clarksburg 20 Mile on Friday as motivation for my last CIM long run, anticipating a supported course and lots of people would make 20 miles more doable. This was a fantastic decision from that standpoint, plus the event was lots of fun. I enjoy small town races like this one. Even though this was technically a 'race,' I didn't treat it that way. I needed it to be a supported training run, to listen to my body, and to have no pressure. When my calves were super, super tight at the beginning, I walked and stopped to stretch a few times. My first 3 miles were slow because of that, but I didn't let it bother me. Once I was warm I settled into a comfortable pace between 10-10:30 and went with it. I walked the water stops and to refuel. The scenery on this course was great - wineries and farms, the countryside, a tunnel through trees. I really enjoyed how peaceful and serene it was. That said, if you like excitement, cities, and cheering crowds, this is not the event for you. 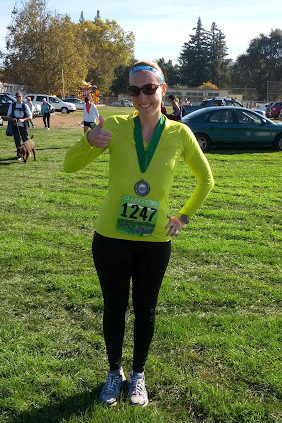 The weather was about 38 degrees at the start and likely mid 50s at the end, just perfect. As I mentioned, the run itself went very well for me, surprisingly well in fact. I kept waiting for the time when my muscles felt crazy tired or my stomach or side cramp had issues, and I was pretty shocked when I ran through mile 18 still felling happy! If I could feel like this the day of CIM, I would be ecstatic. The biggest difference between this 20 miler and my past 18+ mile runs was the cool weather (others were always hot and/or humid), and I wonder how much that played a role in my success on Sunday. Thumbs up for that run. I'm not going into detail on splits in this one because it was a training run, but I will say I'm thrilled with my time of 3:31:34 with an average pace of 10:35 per mile. Really big deal for me! Here are a few logistics from the event too. Packet Pick-Up. We grabbed our bibs and shirts the morning of the event and it was super quick. They had many volunteers helping out and no lines. There was an option to get packets the day before at Sports Authority, but we weren't in Sacramento early enough for that and it definitely wasn't necessary. They gave us long sleeve white tech shirts which I really like because of the small, colorful design on the front. The Course. I mentioned it above too, but I loved the scenery along the course. Wineries, countryside, farms, beautiful sunny sky...I enjoyed it all. The course is very flat. We started and finished at Delta High School in Clarksburg, where they had free parking and plenty of porta potties for the size of the event. The indoor bathrooms were not open and signs said they had 'plumbing issues.' (I have to wonder if plumbing issues = we can't handle tons of runners killing our toilets.) The start was super easy because the race was small, and I never felt too bunched up to run. The Support. The volunteers were wonderful and enthusiastic! The fluid stations were abundant and well-staffed. They had water, Gatorade, and energy chews at the stations. (I'm not sure if every one had energy chews, but it sure seemed like it.) They had course marshals at the turns to help direct runners, and the course was well-marked. The Finish Line. The finish area was small and easy for finding friends. I received my medal from a boy scout, then headed out to grab water and Gatorade. They served a hot lunch in the school cafeteria instead of the normal post-race food, a nice change of pace. We had penne pasta, salad, dinner rolls, fruit, and cookies. There were a few tents with giveaways like Dove deoderant, Power Bars, and Sports Authority goodies. After the race, we went out to Hoppy Brewing Company for brunch and beer with friends. Definitely a highlight of the day! All in all, I had a fun time and am so happy I did the last long run at this event. I might run the half or 20 miler again even if not training for CIM. How great to have a 20 mile race! I would love to do that one sometime. Good luck on CIM. You should do great!!! Thanks, you should do it - great race! Awesome!!! Sounds like a great event, how cool that it aligned with your last long run! Yes - they must have strategically placed this race. I swear everyone running the 20 was training for CIM! For sure - nothing like the CA weather for that! Thanks for reading Kristen - awesome that you did Clarksburg too! Very cool! You got a medal for a training run and you simply owned that run! Doing a race for a long run is an awesome idea! Glad it went so well for you. Thanks Steph, it was definitely worth it. Would do it this way again! Great job! 20 mile races are pretty rare I feel like. Wow...sounds like such a neat race!! Congrats! Hi! How do you think what does your average reader look like?